Seoul (Korea). 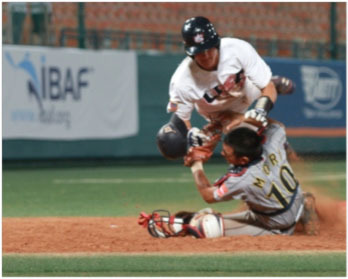 The United States have reached the Gold Medal Game at the XXV IBAF 18U Baseball World Championship. They rolled over Japan 10-5 in the last game of the second round, erasing deficits twice in the process. Japan led 3-0 and 5-3, but a wild seventh inning which featured two fierce collisions at the plate changed the momentum and gave the US the crucial advantage. With the victory the squad of manager Scott Brosius not only reached the championship game against Canada, but also clinched home field advantage. Japan meanwhile dropped all the way to the game for fifth place, facing Korea on Saturday morning. The game also finally decided the fate of Colombia, which now gets to play for the Bronze Medal against Chinese Taipei. The outcome of the game was decided in the bottom of the seventh. Just after Japan took advantage of some defensive miscues to take a 5-3 lead, the US offense struck back powerful. Shintaro Fujinami, who had thrown 14 innings the past two days, came in to defend the two-run lead but he didn’t receive any help from his defense. Reese McGuire and Christopher Okey reached base on consecutive errors by shortstop Fumiya Hojo. The next play was crucial for the remainder of the game even though the United States didn’t score. William Abreu hit into a fielder’s choice, as Reese McGuire was trying to score on the groundball from third base. He bowled over catcher Tomoya Mori, who held on to the ball for the out. However he was clearly rattled, but stayed in the game after a ten-minute injury delay. When the game resumed, the US train just got started. Cavan Biggio gave them the lead with a RBI single to right. One batter later Christian Arroyo singled to right field, as Abreu rounded third base trying to score. Another collision occurred. But this time Mori didn’t even had the chance to catch the ball and the run scored. They would score two more runs on another wild pitch and groundout, capping a four-run rally. Mori finished the inning, but was taken out of the game in the bottom of the eighth. The USA added two insurance runs in the eighth to seal the win. Christian Arroyo finished the night, going 2-for-2 with a walk and three RBI. Christopher Okey scored three runs for Japan. On the mound Kevin Davis got the win, pitching 6 1/3 innings of relief. He issued five hits, three runs and five walks, while striking out six. Starter Dominic Taccolini had conceded one hit, two runs and five base on balls in just 2 2/3 innings. Tomoya Mori was the best player for Japan until leaving. He went 2-for-3 with two walks and two runs out of the leadoff spot. Tatsuhiro Tamura, Fumiya Hojo and Kazuti Iyota scored the other three runs. Rubber arm Shintaro Fujinami gave up five runs (1 ER) on two hits and a free pass in 1 1/3 innings, taking the loss. Yu Kambara and Takahito Otsuka had kept the American bats in check for the first six innings. Still Japan’s manager brought in Fujinami to close it out. But due to a couple of defensive miscues the tactic didn’t pan out.